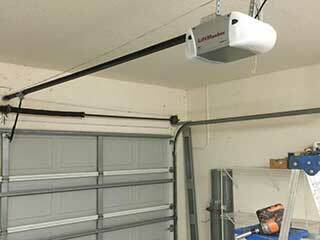 Accidents involving your garage door system can be incredibly dangerous, so it's better to avoid them whenever possible. While some things can be out of your control, with the right maintenance routine, you'll be able to prevent a whole slew of issues from causing your door to malfunction. The service our company provides can do more than prevent problems, we can also ensure that your door reaches its full potential in terms of longevity. Wear and tear is an inseparable part of the movement of your garage door. Every time the panels move up or down, a lot of different parts experience stress inducing friction. The moving metal components are particularly susceptible to this type of damage, so it's important to have the rollers, hinges and springs lubricated often, to reduce the friction that causes them to wear out. Our team will do just that, and while we're at it, we'll check the condition of the tracks, make sure they haven't developed any dents or rust, and repair them if they did. Your garage door springs are bound to start weakening as time goes by. As a result, the door can gradually become unbalanced, which isn't just a safety risk, but a security concern as well. It could leave gaps that burglars could exploit. Our team will test the balance of your door and adjust the springs accordingly. This will have the added effect of reducing some of their strain, which will make them last longer. Spring adjustment can be very dangerous, so we urge you not to try to carry it out on your own. Your electric motor unit comes with special features that ensure it doesn't accidently close the door while there's someone or something in its path. These mechanisms must function properly at all times, which is why our technicians will test them too as part of our maintenance routine. We'll make sure the safety sensors' alignment hasn't changed and that the auto-reverse feature is fully functional and works when the door encounters resistance. Give our team at Garage Door Repair Natick a call and have our experts make sure that every part of your automatic system is fully operational. Don't wait for things to go wrong.